Of course, mountain avalanches are much larger and the conditions that cause them are more complex. A large avalanche in North America might release 230,000 cubic meters (300,000 cubic yards) of snow. That is the equivalent of 20 football fields filled 3 meters (10 feet) deep with snow. However, such large avalanches are often naturally released, when the snowpack becomes unstable and layers of snow begin to fail. 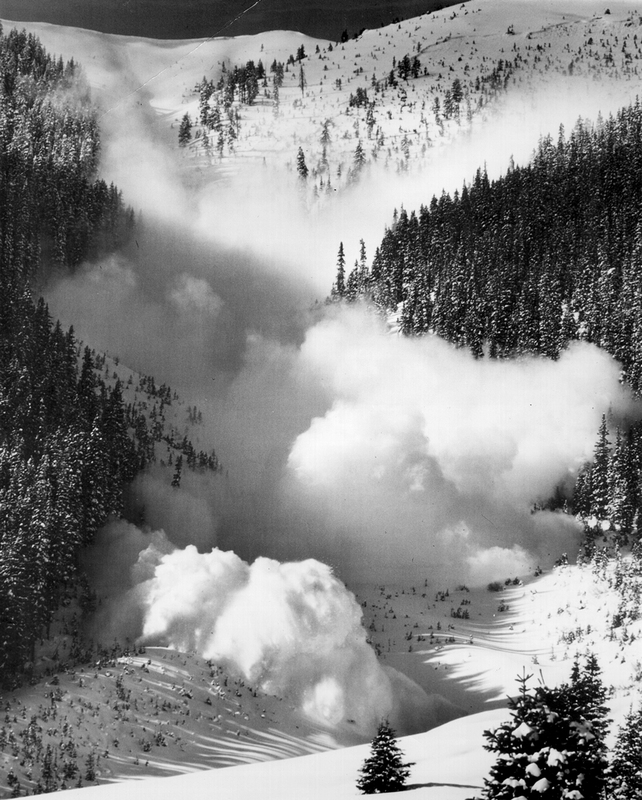 Skiers and recreationalists usually trigger smaller, but often more deadly avalanches. An avalanche has three main parts. 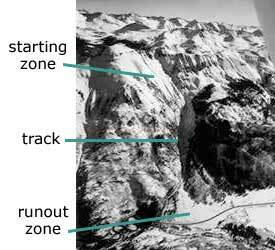 The starting zone is the most volatile area of a slope, where unstable snow can fracture from the surrounding snow cover and begin to slide. Typical starting zones are higher up on slopes. However, given the right conditions, snow can fracture at any point on the slope. The avalanche track is the path or channel that an avalanche follows as it goes downhill. Large vertical swaths of trees missing from a slope or chute-like clearings are often signs that large avalanches run frequently there, creating their own tracks. There may also be a large pile-up of snow and debris at the bottom of the slope, indicating that avalanches have run. The runout zone is where the snow and debris finally come to a stop. Similarly, this is also the location of the deposition zone, where the snow and debris pile the highest. Several factors may affect the likelihood of an avalanche, including weather, temperature, slope steepness, slope orientation (whether the slope is facing north or south), wind direction, terrain, vegetation, and general snowpack conditions. Different combinations of these factors can create low, moderate, or extreme avalanche conditions. Some of these conditions, such as temperature and snowpack, can change on a daily or hourly basis.